I don't have a problem with this. If you know anything about beer, you will reach for the HotD. If you don't know anything about beer, and aren't looking to expand your palate, you will reach for the Blue Moon. And, if you don't know anything about beer, but are looking to expand your palate, you're in for a real treat! Elijah: you're right, it's nothing to squeal about. I just found it humorous. Wow! This is an amazing discovery Bill. 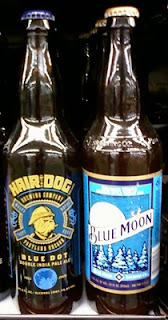 They both have the word Blue on the label, yet they are different beers! Amazing! Great observation skills. :-O Must be a slow blogging day, eh? Yeah, slow day. I thought it was just me, but now I see that you had enough time on your hands to read it and type in a witty riposte. Life is good.